I have received a few e-mails asking whether the bounce is over. I honestly don’t know. 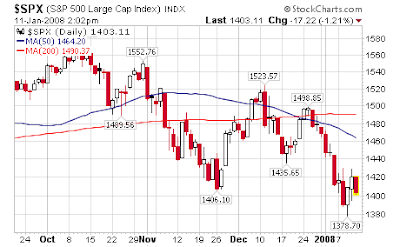 However, in my mind, it’s not officially over unless we breach 1378 on the S&P chart. There is still a ways to go down before that happens. I think what we are seeing today is based on: some skittishness about the financials and exits/profit taking at the first sign of strength. Bounces rarely go straight up. As Rob Hanna points out, reversals usually pullback before making there move up. Trade Update: I went short DSX (another shipper) at $26 and am still holding my few longs until they hit there stops or targets. What is your stop on DSX? It’s over man. The bounce ended after the close yesterday (Thursday) when AXP announced increased delinquencies and write offs. And then this mornings weak reports from Tiffany’s, Best Buy and stuff on McDonald’s. That’s it. In this environment, where sentiment is shifting bounces can be small as people take rallies as opportunities to sell. Agree with your DSX short. BDI shipping index dropped from 11k to 9k. Trend is your friend. Tellzhang: It will be above $26, but I have not put a hard stop yet.Feir: I’ll wait for confirmation, but you may be correct.Davaotrader: I don’t pay attention to the BDI numbers (I’m all about price action), but I do remember the Journal writing an article on the BDI a while back, when it was at historic highs. The stocks tanked soon after.Tellzhang. I don’t know where you heard I trade options. However, it is interesting you mentioned that since placing an option trade this year is one of my resolutions–see latest post.